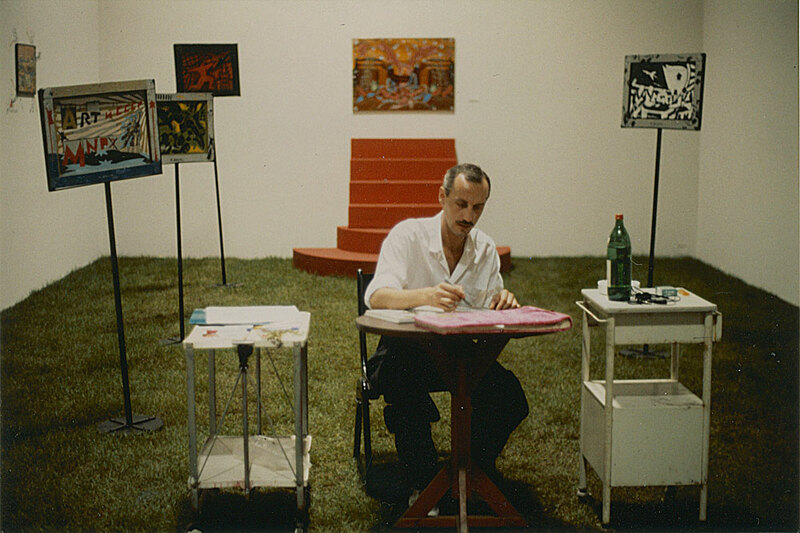 (E-E) Evgenij Kozlov at the exhibition “Der Weg der Ockerfarbenen Elefanten”, Kampnagel, Hamburg, 1991. 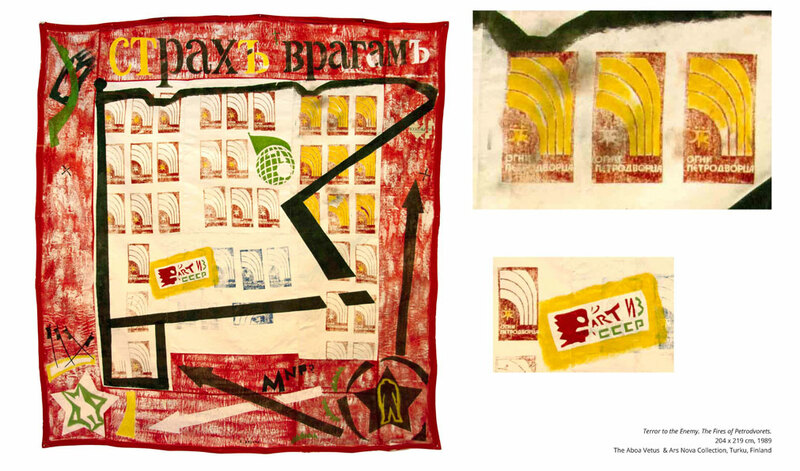 Left: “Lenin Boulevard” from the series “ART from the USSR / ART for the USA“ (1988). ART from the USSR / ART for the USA. 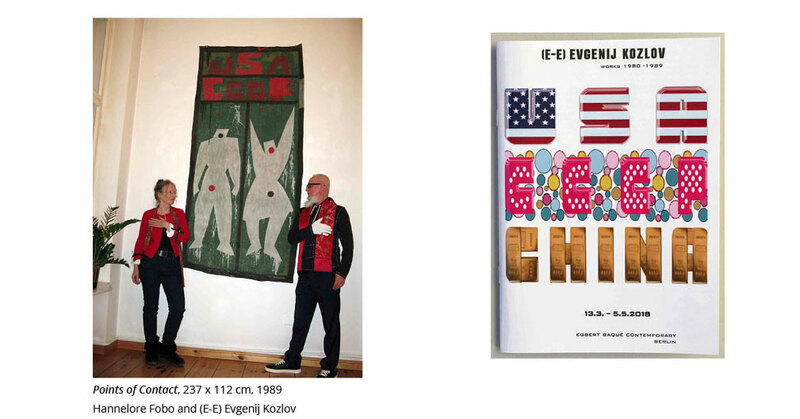 Depending on how narrowly or broadly you define the content-related criteria in relation to USA-CCCP, between 1980 and 1989 you reach a figure of as many as 164 works, including the sketches. 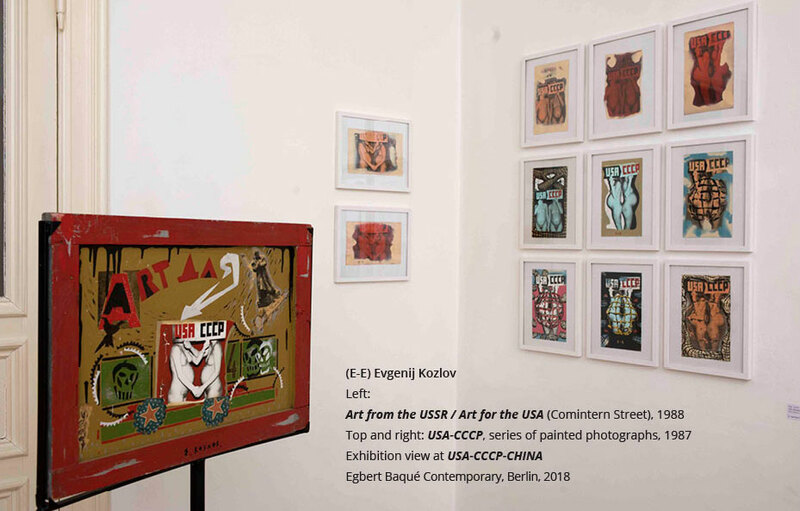 Of the roughly 850 works that have been documented from this period – excluding vintage prints – those that fit the USA-CCCP category constitute somewhat less than a fifth. Kozlov did not treat these works as a unit. They can, however, be summarised under the title USA‑CCCP, with CCCP being the Russian equivalent of USSR. 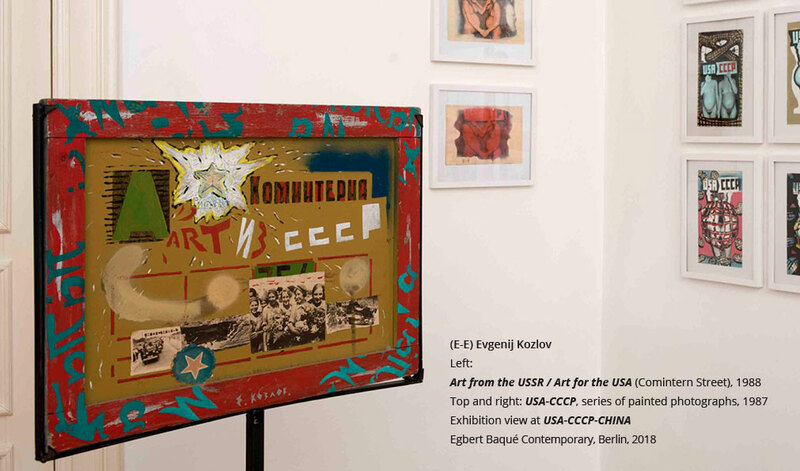 USA‑CCCP provided the title for a number of works from 1986 onwards in that it was actually graphically depicted in these works. Left: Pablo Picasso Still Life with Chair Caning (1912), displaying a piece of oil cloth with a printed pattern in the lower half. creating his own, distinct style. “Objets trouvés” or “found objects“ played an important role – works of art made from objects originally serving another function. Art history considers Picasso‘s Still Life with Chair Caning (1912) as the prototype for this technique. The Dada and Surrealist movements subsequently used this technique to dignify or decontextualise otherwise banal objects. Marcel Duchamps’ “readymades” are classical examples. 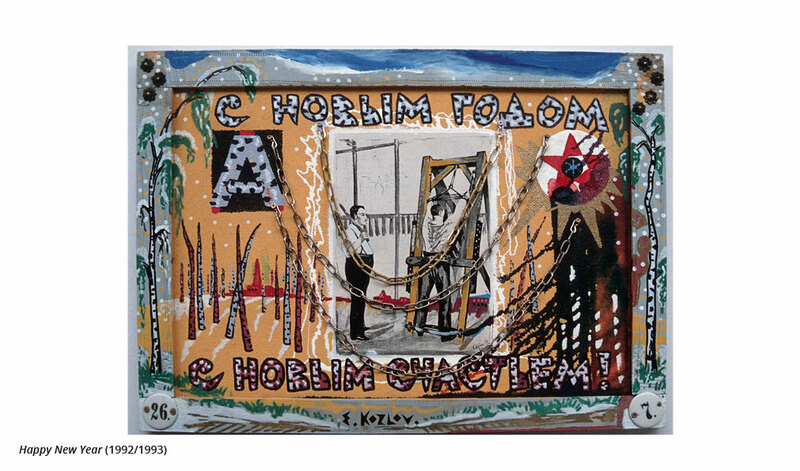 In the works discussed here, Kozlov did not employ found objects in the same manner. Generally speaking, they had the same function to him as any media or material he used for his works, be it paint, canvas, or his own photographs: he chose them because of their visual and haptic – aesthetic – properties. Yet it was just as important to him that these properties should allow him to create a new meaning – not in the sense of an unlikely combination (e.g. Salvador Dali‘s Lobster Telephone), but in the sense of a likely, if unexpected combination. Points of Contact (1988), made from a felt-lined cutlery tray, may serve as an example. It has four compartments for spoons, forks, and knives of different sizes. The two horizontal compartments now display the words “USA” and “CCCP”, respectively, and the two vertical ones the figures of a man and a woman. Thus the object’s very design emphasises these double polarities, although in a second step, the artists reconnects them with the help of two red and two black dots, applied diametrically opposed inside the two figures. The viewer instinctively joins them to form two diagonally-crossing lines – a cross of St Andrew – creating an equilibrium in the dynamic force of the two poles. We find a similar approach in Kozlov’s works on bus-stop signs. As they can be read from either side, they “possess“ a natural polarity. 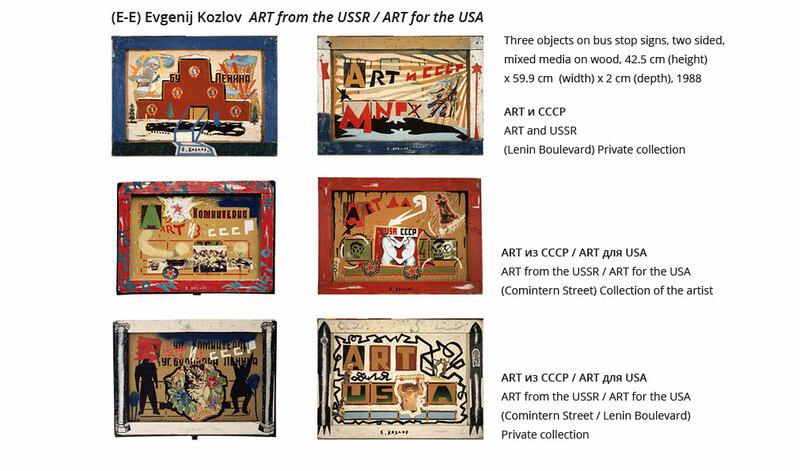 Accordingly, the artist used – with two of the three pieces – one side for the motif Art from the USSR, and the other side for Art for the USA. As a result, the once identical sides convert into a sort of linear account starting on one side and continuing on the other, like the A and B-sides of vinyl records. While both the USA and the USSR were not unusual subjects among Soviet artists, the concept of art coming from the USSR and presented as a gift to the USA was quite unique. Kozlov approached it in a systematic way and chose a variety of symbols to express this idea. Art из CCCP – Art from the USSR, the words on the “A side” – became the logotype for a number of works from that period, especially when attached to a skull shouting these words to the world. Art from the USSR. The Logotype and the Street Names. This logo is reminiscent of Alexander Rodchenko‘s design of the poster “Books (Please)!” from 1924, although the message is, of course, different. The original bus stop signs displayed a number of features that were fully or partly integrated into the compositions in quite specific ways. Of great importance are the street names the artist selected: Lenin Boulevard and Comintern Street. They represent the essence of Soviet ideology. Kozlov “found” these signs in Peterhof, near St. Petersburg, where he lived between 1970 and 1989. Besides, the Soviets had also changed the names of both cities: Peterhof was called ”Petrodvorets” (until 1997) and St. Petersburg “Leningrad” (until 1991). While Lenin and his role in creating a Socialist totalitarian state need no further explanation, “Comintern” is no longer a current term. “Comintern” is short for “The Communist International” (1919-1943), a network of communist organisations from a large number of countries under the guidance of the Soviet Union. Its aim was to achieve world communism - propagated as the bright future of peoples, when they would all live in harmony with each other. The picture of the artist was taken at his studio “Gallaxy Gallery”, Peterhof, 1988. Handbags and fashion are from E-E’s cycle of works Art from the USSR. Terror / Peace to the Enemy. The Fires of Petrodvorets. The Logotype. The bus stop signs have now become historical in more than one way. The streets were renamed in 1993 – “Lenin Boulevard” is again “Erlerovsky Boulevard”, and “Comintern Street” is “Razvodnaya Street.” Likewise, the wooden signs, manufactured in a preindustrial manner, have been replaced by modern ones. The old ones possessed the charm of any individual, slightly improvised production: the raw wooden strips nailed to the ochre board contain knotholes, and the letters and numbers were applied with the help of stencils, which makes the spacing irregular. The size of each sign is, however, standardised: 42.5 cm (height) x 59.9 cm (width) x 2 cm (depth). 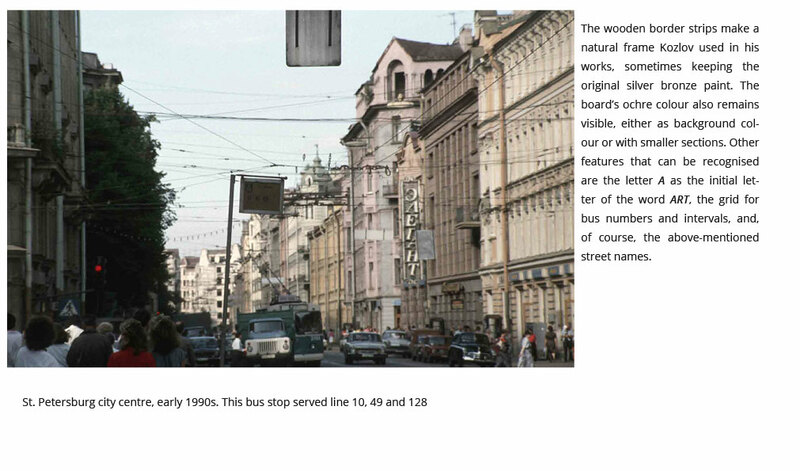 In this picture of Admiralteysky Prospekt bus stop, St. Petersburg, we see one of these historical signs. The picture was taken in the early 1990s. The large “A” stands for Автобус – Autobus, and the numbers refer to the bus lines serving the bus stop. Below each number is a smaller field to indicate the frequency of the respective bus – the time interval, given in minutes. As these fields are left empty, passengers are required to rely on their experience or patience. St. Petersburg city centre, early 1990s. The wooden border strips make a natural frame Kozlov used in his works, sometimes keeping the original silver bronze paint. The board’s ochre colour also remains visible, either as background colour or with smaller sections. Other features that can be recognised are the letter A as the initial letter of the word ART, the grid for bus numbers and intervals, and, of course, the above-mentioned street names. Left: Bus stop pole without a sign at Peterhof, near St. Petersburg. Right: Present-day view of the same place. Left is a bus-stop pole without a sign at Peterhof, near St. Petersburg. It is next to Peterhof library, a short walk from the apartment Kozlov lived in between 1970 and 1989. The picture is from the early 1990s, and the smaller picture below offers a present-day view of the same place. Modern bus stop signs display timetables, routes, and a QR code. From the 1920s to 1993 this street was called “Lenin Boulevard”; its current name is “Erlerovsky Boulevard”, and the bus stop is “Zharnovetsky Street” The three objects from the 1988 series “Art from the USSR / Art for the USA” were made with signs from bus stops nearby – at “Lenin Boulevard / Comintern Street”, and at “Comintern Street” (later renamed Razvodnaya Street). At the same time, the artist used three more bus stop signs to create the “sketches” for his cycle “New Classicals”. Here the original signs are entirely covered with the six motifs. 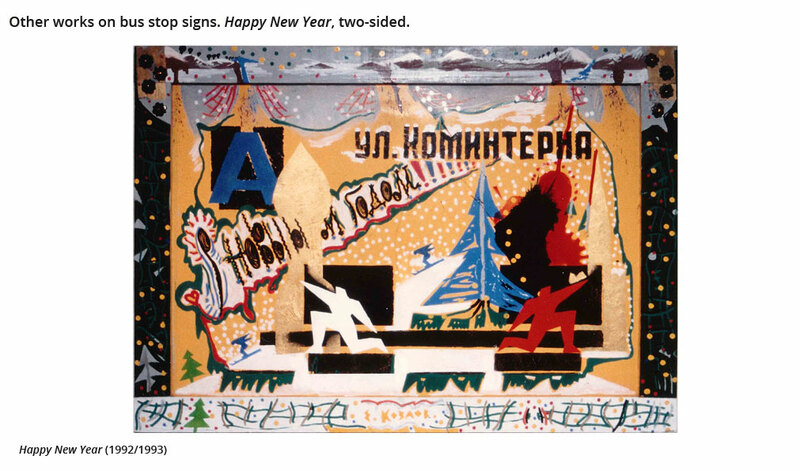 At the turn from 1992 to 1993, Kozlov created another object with a bus stop sign from “Comintern Street”, entitled С НОВЫМ ГОДОМ (HAPPY NEW YEAR. )Thus, the total number of these works amounts to seven. The letters “BU” and “LENINA” are from БУЛЬВАР ЛЕНИНА, Lenin Boulevard. The other letters, including “Comintern Street“ (originally written above “Lenin Boulevard”), have been overpainted. The building in the form of a step pyramid is a reference to the Lenin Mausoleum in Red Square, Moscow, built in 1924 – the spiritual or antispiritual centre of the Soviet Union. Snow is coming down from the cloud to the right, benignly covering the building and the square, with the exception of some dark areas. A newspaper cutting – just above the signature – marks the entrance to the mausoleum. It shows a poem celebrating New Year‘s Eve, although the pathos of the verses is characteristic of an epitathios logos, a funeral oration in honour of the dead. In fact, like an epitaph engraved on a commemorative stone, this piece of paper is closing access to the tomb. Lenin‘s stone sculpture oversees the scene. The words inscribed along the border are a combination of key terms from the French and the Russian or October Revolution: РЕВОЛЮЦИЯ (Revolution, top), РАВЕНСТВО (Equality, left), БРАТСТВО (Brotherhood, right), ТРУД / МИР (Work / Peace, bottom, left and right of Kozlov‘s signature). The reverse of “BU LENINA” displays one of the most popular sculptures from the Soviet period: Vera Mukhina‘s double statue of a “Worker and Kolkhoz Woman” raising high a hammer and a sickle. The giant 24.5 m constructivist sculpture was originally designed for the Soviet pavilion of the 1937 World‘s Fair in Paris and was later moved to Moscow, where it has since been displayed at the VDNKh, the “Exhibition of Achievements of National Economy”. Kozlov’s composition also displays a sketch of Moscow‘s modern skyline. The top border carries the inscription РАЙ – Paradise. The text ART и CCCP (ART and USSR) identifies Soviet art with this type of heroic pathos that celebrates the formerly supressed classes – workers and farmers – as divine warriors. Yet the word left of the sculpture, МИР – Peace – is followed by a question mark. Although subsequently crossed out, it nevertheless raises doubts about the new achievements. Today, the monument is still considered as a major piece of Soviet art. In 2009, it was installed on top of a new pavilion, increasing its total height to 60 meters. Unlike the compact, nearly static composition with Lenin‘s mausoleum, this side of the object offers an extremely dynamic perspective emphasising the movement of the figures. Kozlov set the vanishing point to the top right corner, above the hammer and sickle, to a red star painted on the right border. Strong, irregular diagonals all “rush” to this star, like air filling a vacuum at great speed. ART из СССР / ART для USA • ART from the USSR / ART for the USA (Comintern Street). This piece is made on a “Comintern Street” bus stop sign, and we can see a fragment of the bus line number 354. In 1993, “Comintern Street” was renamed Razvodnaya Street, but bus line 354 still operates the same route today. The bus stop is now called “Universam” – “Supermarket”. Comintern is short for “The Communist International” (1919-1943), a network of communist organisations from a large number of countries under the guidance of the Soviet Union. Its aim was to achieve world communism - propagated as a bright future of peoples living in harmony with each other. The text reads ART ИЗ СССР (ART from the USSR), and the newspaper cuttings with pictures relating to the 1950s (or perhaps to an earlier period) depict an aestheticised image of the Soviet Union: shining cars are driving through Moscow and happy female workers proudly present large bouquets of flowers. On the border of the bus stop sign are symbols Kozlov created for another object: “Mama”, “Papa”, and the figures of a woman and a trumpeter. The other side of this object is entitled ART ДЛЯ USA (ART FOR the USA). Its central part is Kozlov‘s photograph from a series portraying two pregnant women. Using two signs that cover their faces, the two women introduce each other as CCCP and USA. The letter Я (“ya”, which translates as “I“) of ДЛЯ (FOR) shoots an arrow towards the left sign, USA. Another photograph from this series sees the women standing back to back. Kozlov cast a net over their bodies formed from longitude and latitude. Thus the profiles of the two women accurately illustrate the curvature of the Earth’s surface: together, CCCP and USA form the globe. – They are life-bearing. Yet in the bus stop sign, skulls are framing the women on both sides. Life is unmistakably associated with death. ART из СССР / ART для USA • ART from the USSR / ART for the USA (Comintern Street / Lenin Boulevard). As with the previous work, this bus sign was originally taken from the stop at the intersection of Comintern Street with Lenin Boulevard (уг. = угол = corner). it is one of two entitled ART ИЗ СССР (ART from the USSR) on one side and ART ДЛЯ USA (ART for the USA) on the other. The central element of ART from the USSR is a piece of embroidery cut out from a larger work – a little cat sitting in a basket decorated with flowers, its gaze directed at the viewer. Left and right of this sweet creature are constructivist figures of a man and a women. Their abstract, flat black shapes stand in contrast to the elaborate, colourful cross-stitching piece. 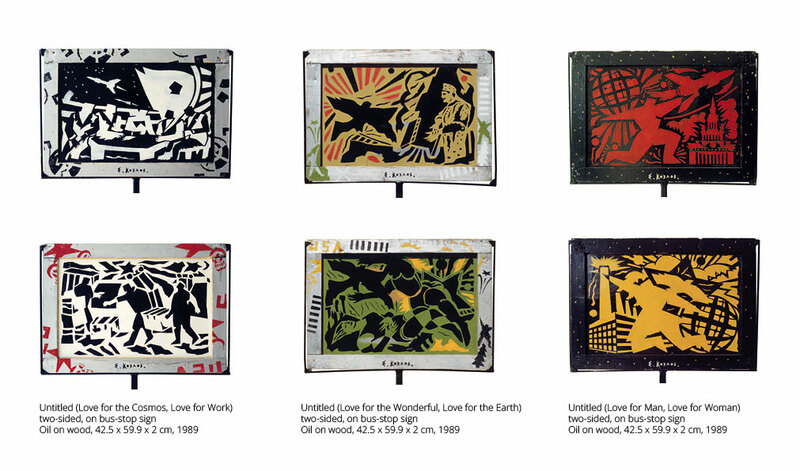 Kozlov designed these stencilled figures for his work Points of Contact, also from 1988, which portrays the USA and the CCCP as a couple, a woman and a man, with the question of who represents who being left to the viewer. The artist developed them further in the cycle New Classicals; first on bus stop signs, then on canvas of a 2x3m format, and finally, in 1995, with his large cycle Miniatures in Paradise – sixteen flags in a 5x2m format displayed around Victory Column, Berlin. The letters in ART ДЛЯ USA (ART for the USA) combine stencilled shapes with handwriting. ART and USA are neatly inserted into the geometrical design of the bus stop sign, with ART again making use of the A, short for “Autobus”. ДЛЯ (for) displays highly ornamental letters with angular curves, resembling wrought iron window grills or graffiti art. A black contour designed in the same zigzagging manner frames the picture. Its central motif is a man standing between the letters S and A of USA. His naked upper body is covered with a multitude of dots and scars – perhaps skin diseases or injuries. The man is holding to a bar upon his head, and with his unshaved face and grim look he represents the cliché of an American prison inmate as depicted by Soviet propaganda – a victim of the capitalist system. Another cliché figure appears to the left of the word ДЛЯ, but as an entirely positive symbol: the little pig “Krusha” from the popular TV programme “Good Night, Little Ones!” (Спокойной ночи, малыши!). First introduced in 1970, “Krusha” has become a dear friend to many generations of Soviet and later Russian children, helping them to exist in a world marked by confrontation and (verbal) aggression, the latter being represented by the missiles painted on the left and right borders. In other words, while Kozlov ironically plays with negative clichés, he does appreciate positive ones, as long as they are pure and innocent. Here it is “Krusha” who wants to make friends – through ART. A little pig called “Khrunia” became the hero of Kozlov’s poem from 1997 Oracles on Orange Peel. Other works on bus stop signs. Three works from the cycle New Classicals, two-sided. According to Soviet propaganda, such inhumane treatment of criminals was characteristic of capitalist societies, while the Soviet system relied on re-education, as Aglaya Glebova states: “Like many of the early gulags – those in operation between 1927 and 1934 – the Canal was widely advertised by the Soviet government, which framed the camps as a humane project to rehabilitate criminals and ‘class enemies’, a re-education policy known as ‘reforging’ [perekovka]. 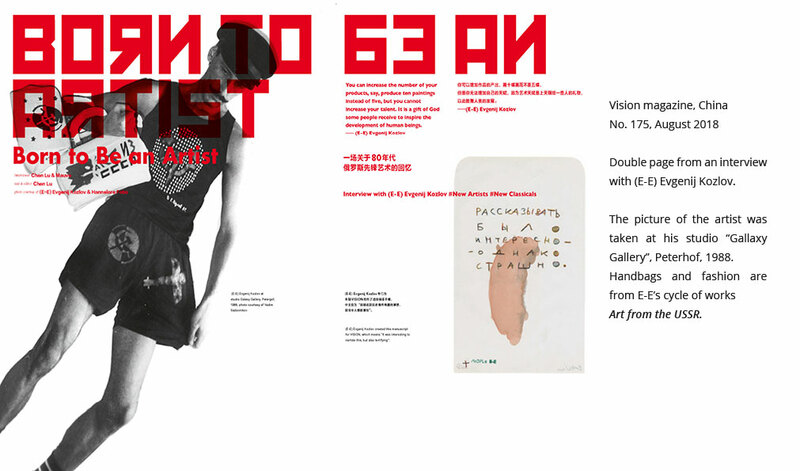 (In: “‘No Longer an Image, Not Yet a Concept’: Montage and the Failure to Cohere in Aleksandr Rodchenko’s Gulag Photoessay”, Art History Journal of the Association for Art History, April 2019, p. 333).